Expectations were high last week that India's central bank would cut rates. After all, the slowdown in growth has become quite visible. Reuters (last week): - ... supporting bond prices are expectations the RBI will cut interest rates by 25 basis points this month after recently weak January-March economic growth data. Some analysts expect an additional cut in the cash reserve ratio, or the money banks must park with the central bank. RBI - ... notwithstanding the moderation in core inflation, the persistence of overall inflation [CPI is above 10%] both at the wholesale and retail levels, in the face of significant growth slowdown, points to serious supply bottlenecks and sticky inflation. Inflation indeed remains sticky. With the rupee at 56 to the dollar (near all-time low), risks of food inflation are still substantial, while labor costs continue to grow (wage inflation has been a real issue). It seems however that some of these inflationary pressures and currency weakness may be caused by RBI's own policies of balance sheet expansion. Reuters: - The OMOs [open market operations] from the Reserve Bank of India would resume bond purchases after a two-week absence, helping offset the impact of expected outflows as corporates start paying taxes ahead of the June 15 deadline. The RBI is injecting funds to facilitate tax payments? If so, that would be a one shot transaction that later gets "mopped" up. 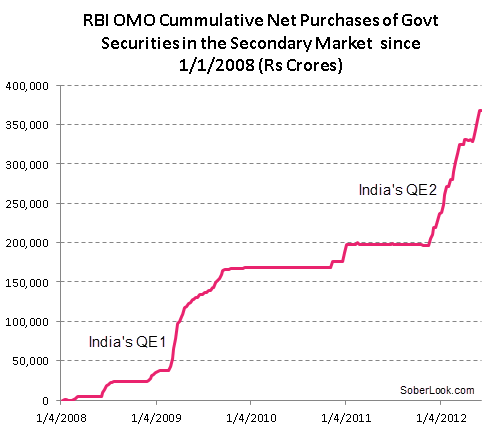 But the RBI has not been selling the bulk of its securities back into the market. In fact the recent aggressive rate of net purchases has been nothing short of a full blown quantitative easing (QE). Credit Suisse: - In FY13, the RBI has bought Rs687 bn of bonds until 12 June. This annualises to an unprecedented Rs3.4 tn of bond-buying, and at 3.4% of the GDP, it is a level of monetary stimulus that is rare even in these times globally. To put things in perspective, the Fed’s bond buying in 2011 was 3.9% of US GDP. The central bank seems to be targeting to lower long-term rates (the 10-year is at 8.2%) - similar to what the Fed has been doing but without selling the equivalent amount of short-term securities. Credit Suisse: - What is worrying for us is that the un-announced purchases continue to be meaningful. Only Rs480 bn of the Rs687 bn has been through pre-announced Open Market Operations (OMOs), and the rest through un-announced unsterilised interventions. The latter can be seen as an attempt at yield management by the central bank. The chart below shows the cumulative securities purchases by the central bank since 2008. This policy of QE could certainly explain the currency weakness and inflationary pressures the nation has been facing. So far this approach has resulted in a stagflationary environment that will be increasingly difficult for the RBI to overcome. Let's hope this provides a good case study for the FOMC as they prepare for the June meeting.